We are one of the leading organizations, engaged in offering excellent quality Hotel Reservation Services. Jumboodeep Adventures & Tours Pvt. Ltd.
With our association with renowned hotels of different range, we offer clients with Hotel Booking Services. We book the rooms for our clients in different hotels as per their requirements and also the budget. 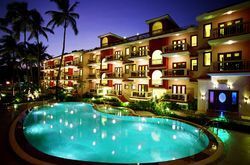 Our personnel make sure that the clients are fully satisfied with the accommodation arranged by us and have all the required amenities they have chosen for. We offer our clients furnished and spacious deluxe single rooms, which are equipped with all modern facilities, such as television and telephone. Our rooms are well ventilated and proper hygienic environment is maintained. Moreover, these rooms have attached bathroom with 24 hours hot and cold water. The single day charge of our deluxe single room is Rs 2500. 1. Stay for 3 nights and 4 days. 2. Airport Transfers by air-conditioned coach from airport and from Karmali /Thivim railway station .No Madgaon pick up, if required would be extra at Rs 1850 one way. Quick, simple, easy to use. Book at over 230, 000 hotels just one call or mail. 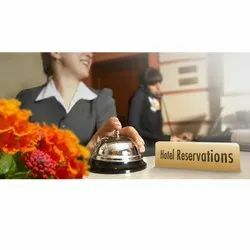 Instant Hotel Booking in a Wide Range of choices from Luxury, Deluxe, Budget Hotels & Resorts and Home Stays Embassy Riches Hospitality to the Customers Doorstep and Also All Types of Hotels Reservations in Across India. Make My Trip Pvt. Ltd.
Search deals and discover experiences worldwide. Whatever type of accommodation you're looking for, we've got it for you. Visit us at https://travels.ozyen.com or call at +91-9910911389. We have newly 10 hotels in delhi. We are dealing budghet class hotel to 5 star hotel in all over india. Situated amidst the historical temples of Thanjavur, the Sangam Hotel provides 54 luxurious rooms with 4 star amenities. Sangam Hotel in Thanjavur (Tanjore) has a stellar record of service to the wide range of travellers to Thanjavur, including pilgrims, international tourists and those on personal or business trips. Instant hotel bookings in a wide range of choices from luxury to resorts and home stays-VIA reaches hospitality to the customers doorstep. The VIA agent network across the country ensures a personal touch to customer needs and customer booking and cancellations are hassle free. ACCESS : 600 meters from Airport. ACCESS : 10 kms. from Airport, 6 kms. from Railway Station.